There is one exception. A good wide track has been added along Durdham Down adjacent to Stoke Road and bicycle logos have been painted at intervals along it. It covers quite a lot (but not all) of a route between student residences to the north of the Downs and Whiteladies Road to the south. A narrower pedestrian path runs in parallel to it, but closer to the busy road that also serves as a car park for visitors to the Changing Rooms and Tea Shop beyond the cyclist in my picture. I went there today to take some photographs of happy cyclists enjoying the good weather and the excellent facility. As I sat down by a tree I took a first picture (see above) and settled down to consider how to go about getting the shots I had imagined. After about fifteen minutes only two other cyclists went past, and none came from the direction that would allow me to get the sunlit smiling faces I had hoped for. It was a puzzle. Behind me I had noticed several cyclists on the road. Eventually a mother and child came past on the cycle track. I took the next picture as they approached the mums with pushchairs who had been chatting for the last five minutes and who barely looked up as the child rang a polite bell of warning. Another five minutes passed and while no more cyclists came by, several pedestrians did. Along the cycle track. The pedestrian path remained empty. I gave up my mission and set off homewards along Ladies Mile, one of the roads that cross the Downs. 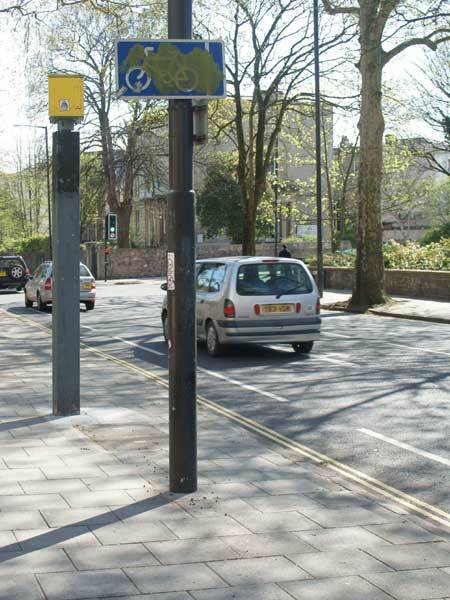 Crossing Ladies Mile was a footpath, a metre of so wide, with NO CYCLING painted in large white letters on each side of the road. I stopped to look and within a minute several cyclists had already arrived, crossed the road and departed, making confident use of the forbidden track. I spotted this well-dressed woman in smart clothes on a smart bike, flagrantly disregarding the NO CYCLING instruction beneath her very wheels. What was I to make of the conundrum? These weren’t odd random events. I’ve actually noticed it happening before. People were using the forbidden track to cycle on, and the dedicated cycle track to walk and talk on. Both sets seemed content with the arrangement. My theory is that people are happier when what they want to do is legal and grumpier when what they are doing isn’t allowed. Even when the converse is true, wise legislators adjust the law to marry practice if no harm comes of it. I think that some of the cycling restrictions on the Downs could be lifted, and some of the paths could be adjusted or shifted so that most Downs users felt even happier about their enjoyment of such a wonderful resource. 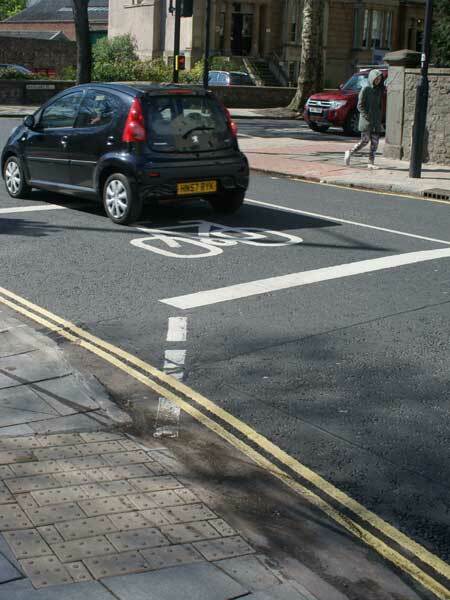 Considerate Cycling 17: Too Many Compromises? There is a newly amended junction on the Greater Bristol Bus Network that, I think, needs sorting out. Preferably by a sharper mind than the one I was born with. In trying to improve bus timings it has created some puzzles for other kinds of users. These include, as we shall see, schoolchildren walking to and from school. 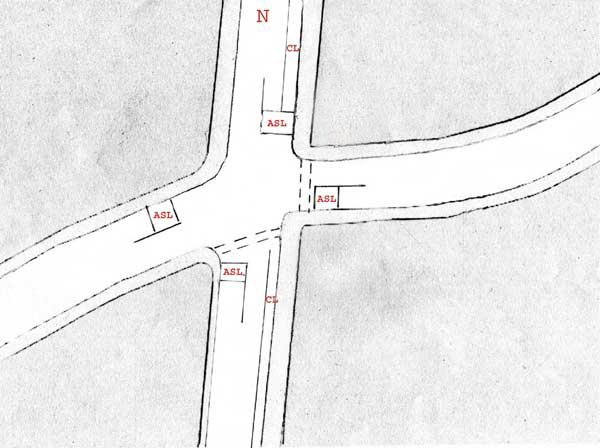 Here is a scruffy plan of the junction. The north-south road is the main bus route, Whiteladies Road. Coming in from the west is Tyndall’s Park Avenue. Over on the east side is St Paul’s Road. 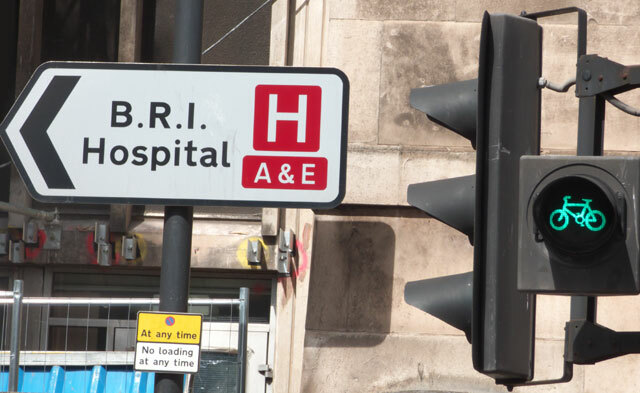 There are two user-controlled crossings, just two, shown with dotted lines. Each of the four corners has its standard traffic lights and each user controlled crossing has a button with lights for cyclists and pedestrians. 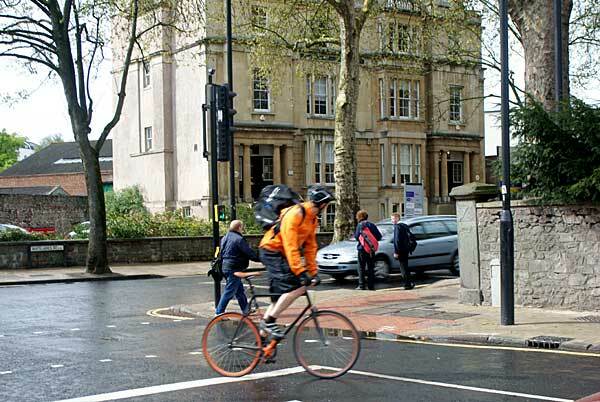 In addition a cycle lane has been painted on the north-south side of Whiteladies Road and there are Advanced Stop Lines on all four approaches. Clear? Well, I’m not sure. For one thing there are several moves that must not be made. This left turn is puzzling a couple of pedestrians who are speculating on crossing where no crossing is provided but it is legal. 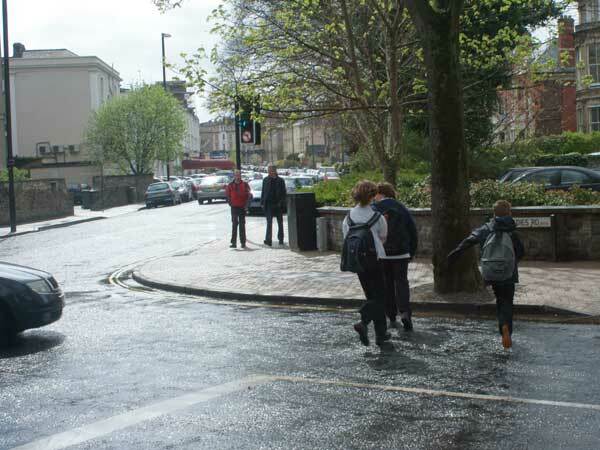 On the same part of the junction these schoolboys are using their athleticism to get home. 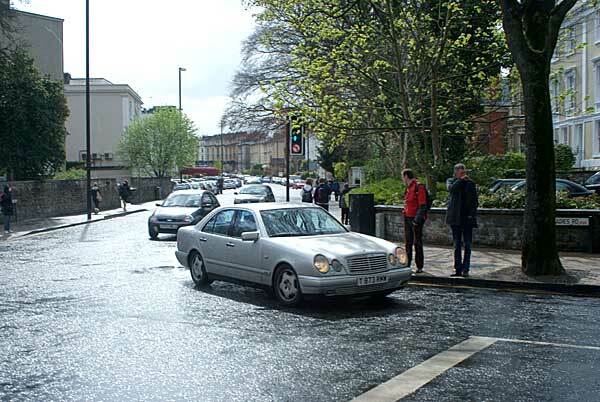 They seem to have been attracted by the empty ASL and the drop curbs that suggest “cross here”. But they are running, just in case. And so are these schoolchildren, with what looks like a more pressing reason to do so. He is travelling north to south on Whiteladies Road. He will have just passed this No Left Turn sign. Notice that he is over the edge of an ASL. 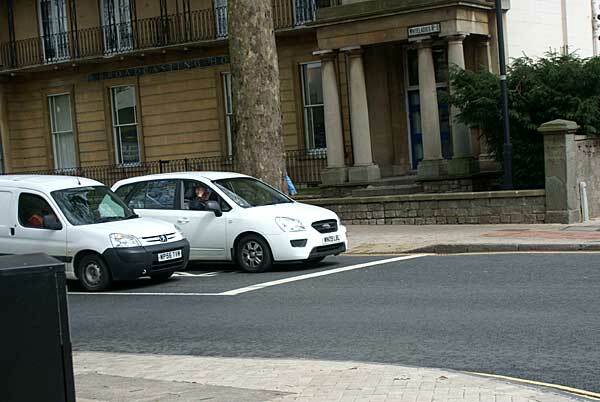 He seems to have crossed the junction and then doubled back to cycle diagonally across Tyndall’s Park Road, possibly taking advantage of drop curbs on the two crossings. Look carefully and you will see the green cycle light showing. 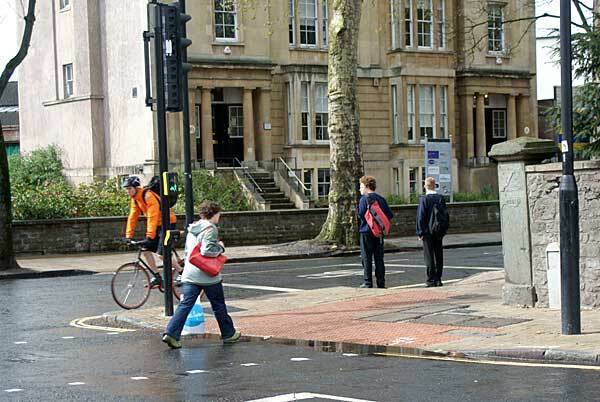 Notice, too, that another couple of schoolboys are waiting to cross Whiteladies Road where there is no light controlled crossing for them. Tyndall’s Park Road at this time of day has a steady stream of school pupils on this side of the road, because this is the side the school is on. Logically they will be making the same choices on the way to school in the morning. 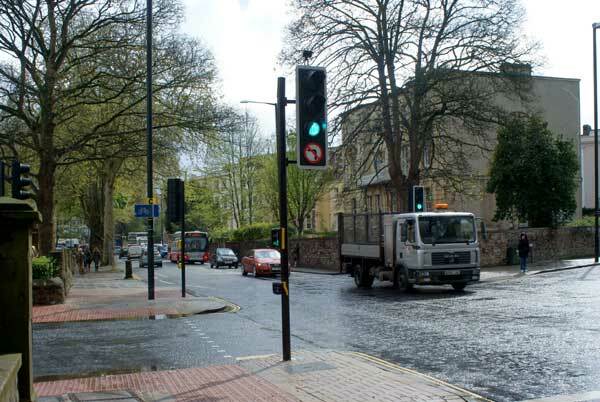 If they made the double crossing required to get over Whiteladies Road with lights, they might still have to cross back over St Paul’s Road again (with no lights to help) to continue their journey. I expect by now that you are now feeling as confused as I do. To help you get everything fixed in your mind, here are some more illustrations of what happens when a City Council tries to please everybody and ends up confusing an old duffer who just wants to know “What am I supposed to do here?”. There’s my cycle lane to The South. Is it just “advisory”? Looks like it. I bet that camera saw me taking pictures at some point. It looks like a cyclist has accepted the invitation to mount the pavement here. Tyre tracks tell the story. Perhaps it was to avoid the “No Left Turn” and scare the pedestrians? 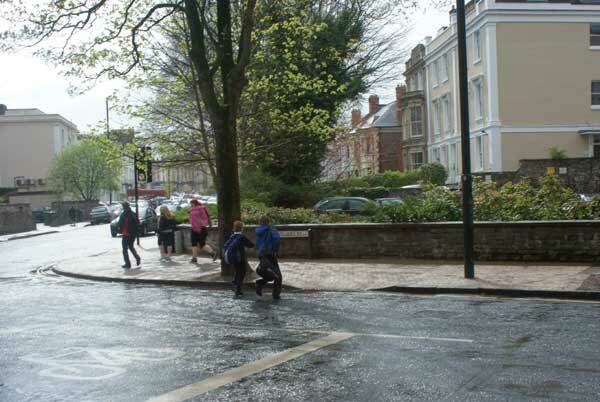 On the other hand it could be one of Bristol’s many unsigned “Shared Space” areas. See that drop curb again? Just the thing for enticing school children onto the main bus route. Shame about the vehicles waiting in the cycle space. And heaven help anyone who used it in a self-propelled wheel chair.